SHiP - the Search for Hidden Particles - aims at the discovery of novel particles from a putative hidden sector that feature only minute couplings to our everyday Standard Model particles. Among the candidates are heavy sterile neutrinos, SUSY particles like the neutralino or axion-like particles in the MeV-GeV mass range. In 2026, SHiP will start as a fixed-target experiment at the CERN-SPS accelerator: The 400-GeV protons impinging on the heavy tungsten target produce D-mesons which decay overwhelmingly into lighter SM particles but might feature minute branching ratios for decays into the hidden sector. About 50-100 meters downstream from the target, the production of these novels particles is measured by their re-decay into lighter SM particles. 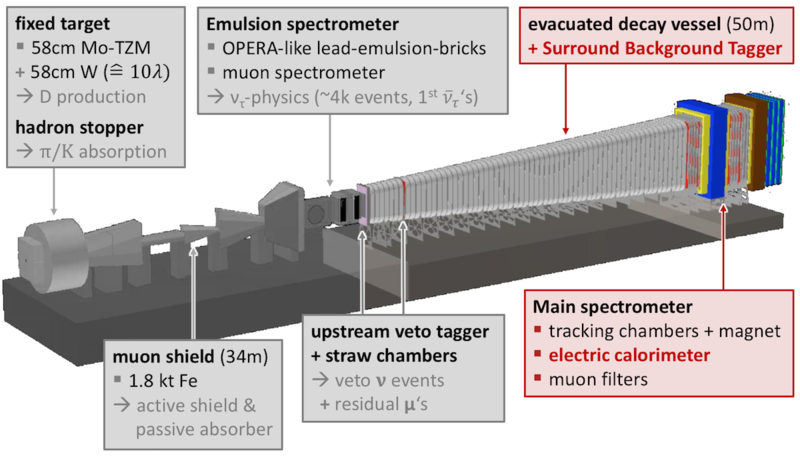 A clean measurement is assured by an evacuated decay vessel and an elaborate system of veto detectors - the challenging objective is a zero-background search at GeV energies, providing optimum sensitivity for ultra-rare decays with branchings in the 10-9 range. The electromagnetic Calorimeter (ECAL) will measure the energies of the decay particles and distinguish electrons from pions and muons. It will be built as an absorber-scintillator sandwich calorimeter and will be huge with a cross section of 5 x 10 m2. The scintillators will be read out with wavelength-shifting fibres coupled to silicon photomultipliers. To also measure the directions of photons and be able to detect neutral particles like ALPS which decay to two photons, the calorimeter will be equipped with additional layers of high-resolution. These layers will be made out of MicroMegas chambers which can reach spatial resolutions of a few tens of microns and therefore are able to determine the direction of electromagnetic showers. To assure a clean measurement of particles originating from the evacuated decay volume, it is of paramount importance that all events originating from particles entering the vacuum vessel laterally are identified as background. The corresponding veto detector, the SBT, envelopes the vacuum vessel with a 30-cm strong layer of organic liquid scintillator. Light signals created by particles entering the SBT are read out by photomultipliers with attached Wavelength-shifting Optical Modules (WOMs). The Mainz group is optimising the scintillator composition in terms of light yield, transparency and chemical durability. Moreover, we are advancing the geometry and light collection of the individual SBT cells. Please contact Dr. Rainer Wanke or Prof. Dr. Michael Wurm for Bachelor, Master and PhD theses.